Here are a collection of unsorted factoids learned during our recent visit to Paris to learn about Renault’s upcoming electric cars and various other green motoring projects. Quick-drop battery swap stations won’t be cripplingly expensive to set up, because they’ll only need to hold 10 batteries, with each battery costing about €8,000 to €9,000. Why so few? Using three-phase AC electricity it will take no more than 30 minutes to fully charge a flat battery. It takes three minutes to swap a battery, so each station can’t physically serve more than 10 cars per half hour – ergo the station only needs a pipeline of 10 batteries to keep on delivering ad infinitum. 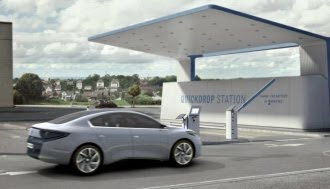 Two prototype swap stations have been built – one in France and one in Israel – and Renault says they have racked up tens of thousands of test swaps to date. Never mind range anxiety, what about battery life anxiety? Renault says it isn’t worried that its lithium-ion cells will conk out after a couple of years as most cellphone, iPod and laptop batteries do with alarming predictability. The secret to a long and happy life if you’re a li-ion cell is to stay cool, apparently. Active temperature regulation with air cooling will feature in all Renault auto batteries – and is notably absent from all laptops and phones. The Renault Fluence ZE and Kangoo ZE will be built on the same production lines as their fossil-fuel equivalents. Weight is key to consumption, as we all know, but it’s worth considering that every 10kg of car equates to about 1g/km of CO2 using today’s technology. To meet ongoing EU fleet emission targets, Renault is aiming to cut weight by 150kg to 200kg per generation as it introduces new models, saving 15 to 20g/km. Laguna 3 weighs 150kg less than its predecessor, for example. The company says weight is now just as important as cost and time to market when developing new models. We drove a new Scenic fitted with Renault’s new dual-clutch manual gearbox, a dry-clutch six-speeder with electric rather than hydraulic actuators. Unlike a slushmatic it’s as economical as a manual in official consumption tests, and might even surpass manuals in the real world, according to the firm. We loved it – effortless in use, with imperceptibly smooth changes, and not afraid to jump down a couple of gears if you put your foot down. There’s a manual mode, but why would you bother? Renault’s state-of-the-art factory in Tangier, Morocco burns olive stones as fuel for its industrial boilers, helping to make the plant a zero-carbon factory. Forget piddling upshift reminders on the dashboard – Renault plans to use your satnav’s voice to coach you in more economical driving. We assume drivers will be able to switch the system off... Coaching will be key for EV drivers in particular to get the best range from the finite charge in their battery. While we were in Paris we received a taster session of eco-instruction, thankfully from a human being rather than a disembodied voice. We were sceptical at the outset but ended up being bowled over by the scale of our improvement piloting a diesel Clio around crowded city streets. Stay tuned – we’ll provide a full report in our next blog post. Meanwhile, for more on Renault’s wide-ranging eco-efforts, visit its Sustainable Mobility web site.